Stephen Ministry is a way in which congregations can provide high-quality care and outreach to hurting people in the congregation and the community. Stephen Ministers are carefully chosen congregation members with 50 hours of training, ready to provide one-to-one Christ-centered care to hurting people. 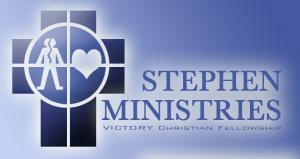 Each Stephen Minister is matched--men with men and women with women--to a person who is experiencing difficulty. They meet weekly to listen, care, pray and encourage. Stephen Ministers care for those dealing with grief, divorce, job loss, hospitalization, financial struggles, loneliness, terminal illness, and many other painful life experiences. Contact Pastor Ken Hildebrand or one of our Stephen Leaders (Robin Hildebrand or Linda Harris) for further information. Robin and Linda can be reached by leaving a message with the church administrative assistant.